INDIANAPOLIS, IN - The Women’s Basketball Coaches Association (WBCA)and Allstate Insurance Company today announced 97 nominees, including four from the WAC, for the 2017 Allstate WBCA Good Works Teams®. This esteemed award honors an outstanding group of student-athletes who represent the sport’s finest in the areas of community service and leadership among their peers. DENVER, CO - NM State sophomore guard Brooke Salas was named Western Athletic Conference Player of the Week after putting up a double-double in the team’s season opener, which helped the Aggies beat San Jose State, 66-55. This is the first WAC player of the week honor of Salas’ career. The Placentia, Calif. native dropped 18 points, including 4-4 from the free-throw line, and a career-high 13 rebounds. This was the first double-double of the sophomore’s young career at NM State. 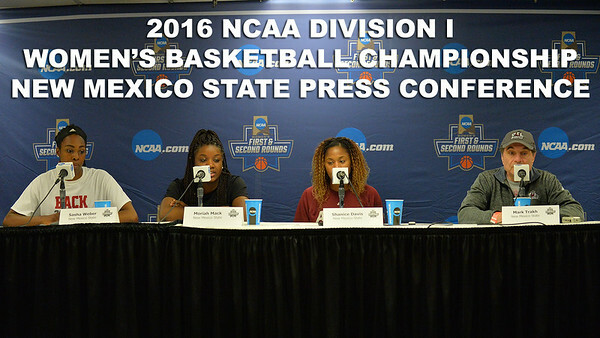 LAS CRUCES, N.M. - NM State head women's basketball coach Mark Trakh bolstered his roster for the 2017-18 season with the additions of Kalei Atkinson, Shanaijah Davison, Makayla Mabry, Pam Wilmore and Jaelyn Royal on national signing day. The signings feature three guards and two forwards with a pair being ranked in the top-150 nationally. DENVER, CO - The NM State women's basketball team was voted as the favorite to win the Western Athletic Conference in the 2016-17 WAC Preseason Women's Basketball Coaches and Media Poll, the conference announced on Wednesday. Shawnte’ Goff of UT Rio Grande Valley was selected as the Preseason Player of the Year. Senior guard Moriah Mack was chosen as a member of the All-WAC First Team in both polls. The Texas native earned First Team All-WAC and WAC All-Defensive team honors in 2015-16 after she averaged 11.7 points and 5.4 rebounds to go with her 50 assists, 40 steals, and 46.2 field goal percentage. In the head coaches poll, NM State tallied 7-of-8 possible first-place votes for a total of 49 points. UTRGV came in second with 42 points and the remaining first-place vote as Grand Canyon garnered 34 points for third. CSU Bakersfield tallied 29 points while UMKC (26), Utah Valley (23), Seattle U. (13) and Chicago State (8) rounded out the rest of the league. In the media poll, the Aggies earned six first place votes to total 90 points which just beat out UTRGV, who earned five first place votes to finish with 88 points. The media poll was quite similar to that of the coaches poll except Utah Valley was predicted to finish fifth and UMKC in sixth. CSU Bakersfield received the only other first place vote. Joining Mack on the preseason first-team list is senior Brianna Freeman in the coaches poll. NM State led the pack with two players selected while Grand Canyon, UTRGV and Utah Valley each received one. LAS CRUCES, N.M. - The two-time defending Western Athletic Conference Champion New Mexico State women's basketball team announced its 2016-17 schedule, featuring 13 home contests. Head coach Mark Trakh's Aggies return three starters and 10 letterwinners from last year's 26-5 (school record for wins) team that captured their second-consecutive WAC regular season championship (13-1 league record), WAC Tournament title and NCAA Tournament appearance. LAS CRUCES, N.M. - New Mexico State head women’s basketball coach Mark Trakh completed his staff with the hiring of former Nebraska standout Ashley Ford. Ford joins the NM State women’s basketball staff after spending the 2015-16 season as an assistant coach at Nebraska, her alma mater, where she was the starting point guard from 2005-07 under head coach Connie Yori. LAS CRUCES, N.M. - New Mexico State head women's basketball coach Mark Trakh continues to assemble his coaching staff with the addition of former Auburn standout, Blanche Alverson on Tuesday. "We're fortunate to have Blanche as a member of our staff," Trakh said. "She was a star player at Auburn and came highly recommended at Texas Tech. Blanche has great potential to become a great recruiter as well. She has a great future and I look forward to working with her." LILBURN, GA - New Mexico State women's basketball assistant coach Aarika Hughes was named as one of the Women's Basketball Coaches Association's inaugural "Thirty Under 30" honorees on Friday. "Aarika is one of the top youngest assistant coaches in the country and I'm honored to have coached her as a player and to have a relationship with her as an assistant coach," head coach Mark Trakh said. "I'm very proud of her for what she's accomplish. She's a great game-planner, runs practice very well and is one of the top recruiters in the country in my opinion. I think her potential is limitless."